Quick! How many names has the stadium used in its 30 year history? 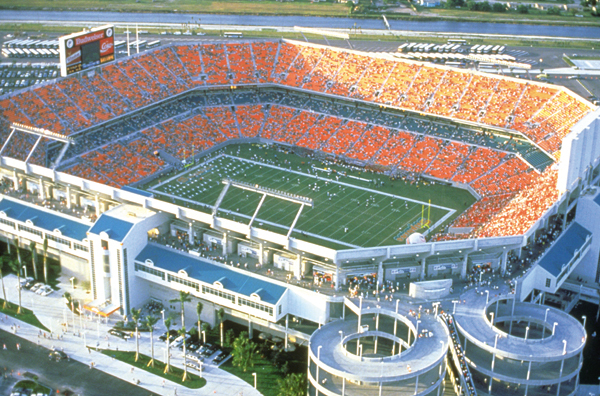 Who remembers "New Miami Stadium" ? Not me, for it was only that in the off season. I take you back to August 16th, 1987. The first Dolphins game ever at Joe Robbie. It was preseason and we lost to the Bears 10 - 3 in a very boring contest, but the game will forever be in my memory as my wife, who was 8 1/2 months pregnant, did not want to miss the game. It was so surreal that CBS actually interviewd us on the nightly news. Here we are on a hot August night waiting to see our team. I have a video somewhere that documents it. The three of us. 11 days later our one and only son was born, and he still bleeds aqua and orange. So Happy Birthday to the stadium. Personally along the way it has been a sad journey at times. In 1989, losing to the Chiefs the last game of the season in 40 degree weather, knocking us out of the playoffs. Jim Kelly and the Bills broke our hearts big time in 1993 when we lost a Championship playoff game in our own backyard 29-10. Since then we have never been that close. One thing I remembered as a recurring issue was noise. As loud as we yelled at the new stadium, it just wasn't as loud as the old Orange Bowl, but the stadium we knew 30 years ago is LONG gone. The new stadium IS loud, thanks to the new roof and strategic angles of the speakers. 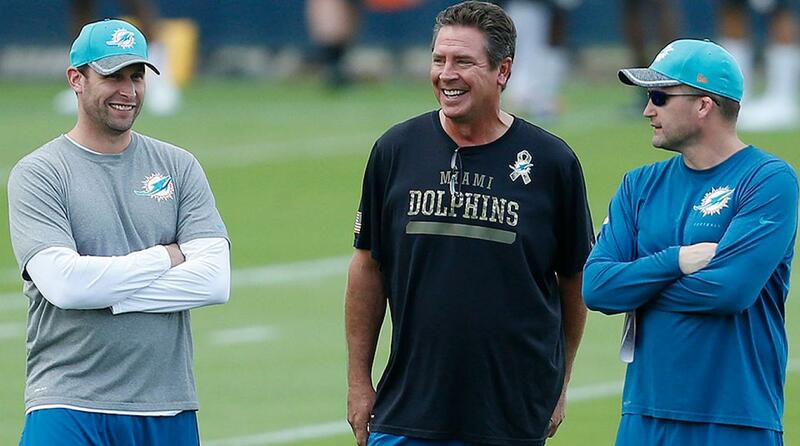 We saw Shula and Marino retire. We saw Larry Little, Richmond Webb, Nat Moore, Duper and Clayton, added to the Ring of Honor. 2002 was the year of Ricky Williams. 2003, the Orange jerseys made their debut in a 24-23 win over the Redskins. 2005 introduced us to the Gallery of Legends. 2007 was the year of Jason Taylor, playing in 129 consecutive games. 2010 saw the new Don Shula statue. These are images that roll through my mind. It is by no means comprehensive (you can grab a Media Guide for that) and you may also have other memories that are bigger than this. But Happy Birthday Joe "Hard Rock" Robbie Stadium, you are a part of our lives and memories, and here's to the next 30! Go Dolphins! With Miami's 23-20 win over Atlanta in the preseason opener, the Dolphins look to make it two in a row to start the preseason this Thursday night vs. Baltimore at 7 p.m. The Dolphins haven't won their first two preseason games in the same season since 2011, when they finished the exhibition campaign 3-1. Since Hall of Fame Head Coach Don Shula retired following the 1995 season, the Dolphins have won their first two preseason games just five times. 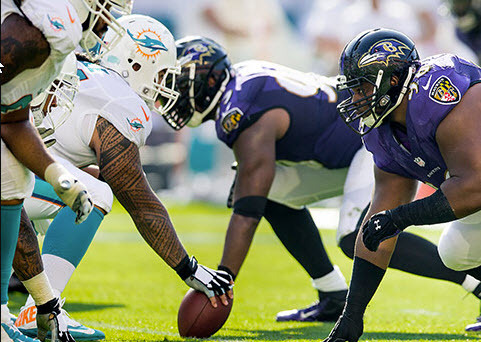 The Dolphins and Ravens will meet twice this year - once this Thursday night in the preseason and again in a Week 8 Thursday Night Football matchup in Baltimore on Oct. 26. It's the second team Miami plays in both the preseason and the regular season this year, meeting Atlanta last week and again in Week 6 of the regular season. This year, it is evident that the team has grown in depth due to the combination of Chris Grier, Coach Gase and big Mike Tannenbaum. Attending Training Camp, and the first preseason game, it is so apparent that the new draft picks, and sophomores look to be real talents. This team radiates a culture of their head coach, Coach Gase. They love him and love being coached by him. They are becoming true believers together. This, even with key injuries to Ryan, Tony, Ted and Raekwon. Unfortunately, this is the NFL. Coach Gase was quoted the day after Ryan went down that it was the best practice of training camp to that point. He did not want anyone to hold back. He did not want to see any dialing back of intensity despite their setback with Ryan. He wanted everyone to go out there and “give it their all”! That is exactly what the team did. There were no drops in intensity. That meant a lot. Every year we get disappointed with injuries. However, I feel that with the leadership of this team it is different. Our leadership is respected; it is rising up and they all believe in the team and the next man up. So despite all of our injuries, I trust our leadership is doing the right things. So, do not panic, Finatics. They got this. GO FINS! LISTEN UP! Send me your thoughts because FANS TALK! This has been a BRUTAL year for training camp, Finatics. Thank goodness it is now over. The competition out there is FIERCE. The guys are hitting hard. And the injuries are running wild. 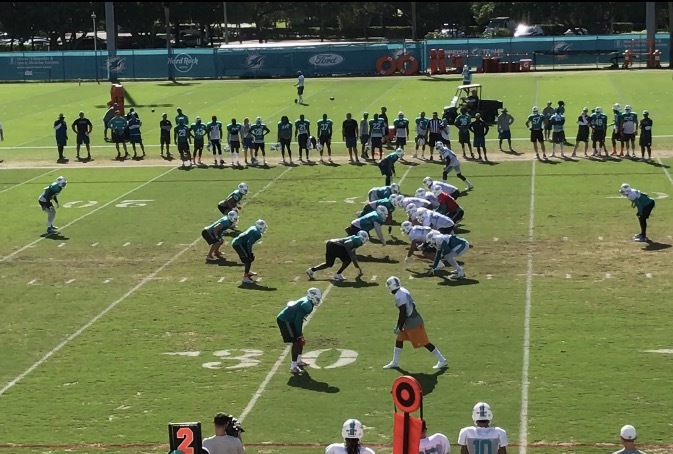 Our observations from training camp.. Defense looks great. The defense definitely won at camp. And there is some really hard hitting coming from the defense. So much so that the Dolphins sustained 2 RB concussion at camp..
RB Jay Ajayi. Concussion. Good news is that he is back on the practice field this week, and will see some playing time, possibly as early as the Baltimore game on Thursday. RB Kenyan Drake. Concussion sustained on the practice field on August 14th. CB Tony Lippett – Torn Achilles tendon sustained on the practice field on August 14th. Out for the season. QB Ryan Tannehill. Tannehill reinjured his ACL in a non contact play. Out for the season. LB Raekwon McMillan. Injured on his first appearance on the field, on the first play during the Falcons preseason game. Out for the season. WR Francis Owusu – Despite scoring in preseason vs. Falcons, he injured his knee in camp, and then released. WR Jordan Westerkamp – sustained hamstring problems in camp, played in Falcons game, released. OT Kwayde Miller.. Injured and released. Camp is officially over, but the Dolphins have a joint workout next week with the Philadelphia Eagles prior to the game there on Thursday the 24th. We just pray that there is no more injuries to our already thinning team. Debby Downer: Last year, the Dolphins worked out with the Carolina Panthers, where Louis Delmas sustained a season ending ACL.